Cloud-based solutions that enable simulation-as-a-service—either through complete outsourcing of simulation or opportunistically accessing simulation tools on an as-needed basis—have made this easier. 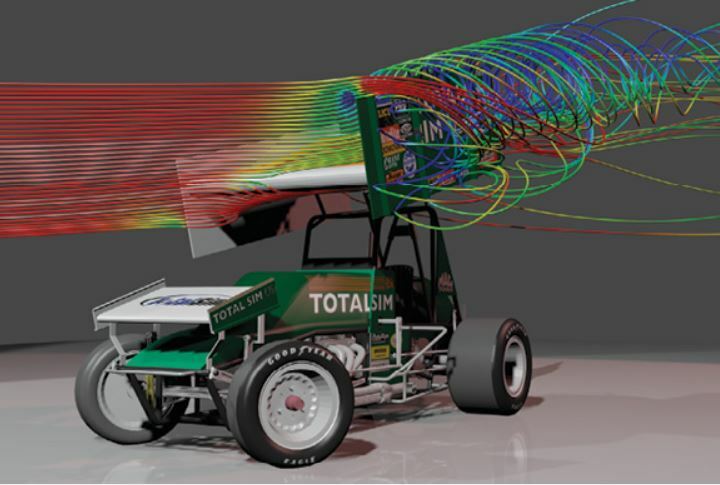 “Whereas a few years ago clients were really not averse to bringing simulation tools in house, development schedules and markets are moving at such a fast pace that clients are willing to pay a premium to leverage outside expertise and resources,” says Scott Herndon, manager of simulation client development for CFD (computational fluid dynamics) and FEA (finite element analysis) at IMAGINiT Technologies. IMAGINiT offers cloud-based Autodesk products, and has also developed its own mini-cloud resources on its own supercomputers. “With smaller companies that have not used HPC in the past, by having access to the cloud they are able to run bigger jobs once they outgrow what they can do on a workstation,” says Gabriel Broner, vice president and general manager of HPC at Rescale. Although the availability of cloud-based simulation-as-a-service solutions is expanding, in some cases these operations require the transfer of large amounts of data or the use of simulation tools that require very low latency. This can prove to be challenging, particularly for small- to mid-size businesses (SMBs) that may not have access to direct, high-speed connections to cloud providers or other network infrastructure. The availability of new high-speed networks can enable new types of services. Simulation services company TotalSim, for example, has been able to leverage access to a local gigabit fiber network at its home base in Dublin, OH, as well as the resources of the statewide OARnet (Ohio Academic Resources Network) 100G regional network and the Ohio Supercomputer Center. “I can’t overstate how important it is for us within the city of Dublin to have access to these networking infrastructures,” says Leto. Leto’s company was involved in a project to make simulation applications available to customers using those high-speed network resources. Working with researchers at Ohio State University and other technology partners, TotalSim was able to offer simulation capabilities to customers with very little latency. “We’re not networking people, so we’re not always thinking about the challenges on that side of the problem,” Leto says. The push for municipalities to expand their gigabit network infrastructure, and then offer access to those networks ilike they offer access to water, sewer and other utilities, will help make these cloud-based applications easier to use and access. Companies are also finding other ways to tap into cloud-based simulation resources. Workload data can be placed directly in the cloud so that the data is not moving back and forth between the user and the cloud infrastructure. In Dublin, TotalSim teamed with the city, Ohio State University, the OARnet network and other entities to create an app-based approach to providing access to simulation and compute resources to local businesses. 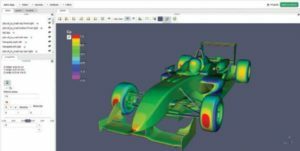 The team at OSU worked with TotalSim, which uses HPC resources to test virtual prototypes for clients in the aerospace, automotive and manufacturing markets. The problem TotalSim wanted to solve was to find a way to provide access to data-intensive services without overwhelming the public network and bogging down simulation activities for its clients. The project was funded in part through an award from US Ignite, a nonprofit focused on helping to create services and applications that leverage advanced networking technology. Launched in 2012 by the National Science Foundation and White House Office of Science and Technology Policy, the initiative has helped launch and support Smart Gigabit Communities (funded by the NSF) that offer access to high-bandwidth networks (among other things). Those cities include Cleveland, Austin, Chattanooga, Kansas City and others. The application allows users to remotely access the software and compute resources through a virtual desktop-as-a-service system for manufacturing. Users access results of simulations via a thin-client connection to a virtual desktop, whereas the heavy lifting of the large data sets is handled on the DubLink and OARnet fiber networks. Dublin rolled out its own gigabit network called DubLink, which serves as the backbone of the project. It connects to Metro Data Center, a regional supercomputing facility in the city and runs parallel to OARnet, Ohio’s statewide 100 gigabit network. Calyam says the project built on existing networking resources that had not, to that point, been operationalized with any applications. Funds from winning a Mozilla competition helped launch the prototyping phase, and Calyam was able to obtain a donation of cloud data center GENI racks and last-mile fiber connections. By reducing latency, the application allows better real-time collaboration between TotalSim and its customers, which can speed up iterations. Having local infrastructure was critical, as distance between the companies using the app and the compute resources can affect latency. “Even if you have a gigabit network all the way from here to Oregon, you can’t necessarily provide the responsiveness you’d get having the application hosted in Dublin and distributed over local Dublin fiber,” Ricart says. Although high-speed fiber networks are expanding, and the number of Smart Gigabit Communities is growing, not every small or mid-sized company has an on-ramp to this infrastructure. Fortunately, there are other ways to successfully access cloud-based or hosted simulation solutions. More direct connections are also available. “We see direct connections filtering down to SMBs as cloud usage starts to grow,” Kaneshiro says. For example, services like Megaport can help companies establish those direct connections to cloud services. Where the company does see a challenge is with interactive 3D post-processing or manipulation. “But every year the tools are getting better, and people are figuring out how to make the rendering work faster and the remote visualization capabilities through the browser are getting better,” Leto adds. Taking advantage of solutions that offer different access options is important for making simulation-as-a-service work for smaller companies. Leto says that “bare metal” HPC installations provide the best bang for the buck when it comes to CFD simulations. Public cloud services like Amazon or Google can provide greater scalability. It’s also important that the various high-speed networks typically available in larger cities can be coordinated and integrated as these high-speed networks expand, and that’s been a big part of US Ignite’s efforts. “We are rapidly seeing the ‘gigafication’ of the American internet,” Ricart says. With a local hub that connects those networks, communities can reduce latency; otherwise, traffic may flow hundreds of miles away before it can be relayed and exchanged between network providers. Cities can establish digital “town squares” where a variety of applications and services are available for use. That presents an opportunity for companies with heavy simulation needs to access compute resources they would otherwise be unable to afford, while helping cities attract and retain high-tech businesses.